It is one single word that underlies and connects the most recent works by Ukrainian artist Lada Nakonechna: estrangement, or Verfremdung in German. 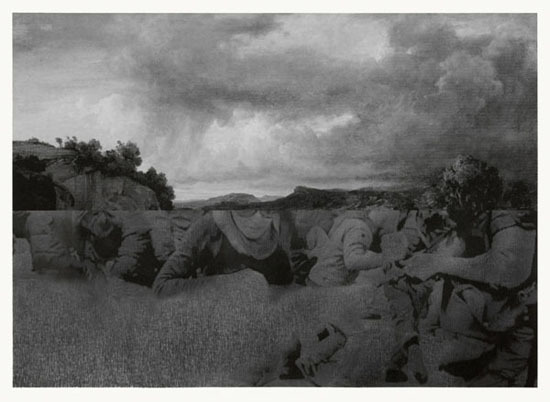 At first glimpse, her large-format pencil drawings Constructing the new landscape 1 – 11 (2012) as well as the associated video work in the first room of the exhibition show landscape scenes and cloudy skies, harmonic and overwhelming, following the tradition of English 19th-century Romanticism, but at the same time, an approaching break in the weather is lurking through the dark clouds, a menacing disturbance of the peaceful idyll. This comes down radically and abrupt in every single work: A a second image cuts in from the bottom, parts the naturalistic scene in two with a hard horizontal line and overlaps with the distant background. Instead, the bottom body halves of uniformed policemen and protesters become visible, barrels and clenched fists, banned on the sheet of paper by countless pencil lines, the meticulous work of days and weeks. Like an image interference on TV or the website that takes too long to load, one image slides over the first. But neither the context of the individual scenes, or the faces of the protagonists become fully evident, nor do the images reveal their original location. Following the Brechtian Verfremdungseffekt, Lada Nakonechna uses estrangement to interrupt the familiar image, to destroy an illusion, and to draw the attention away from the story told but towards the observation of the means of telling and constructing it. The term estrangement (Russian: остранение / ostranenie ) was already used by the Russian Formalist Viktor Shklovsky in 1914 to describe a new purpose of art, which was to change the perception of the world by showing its subjects in an estranged and alienated way. Later, the term estrangement was also used by Brecht in German, and was then misleadingly translated back into the Russian language with alienation. In Ukrainian and Russian, there is only one translation for the German words Verfremdung (estrangement) and Entfremdung (alienation). Linguistic errors when translating German writers, like Bertolt Brecht or Karl Marx, who crucially introduced the term Entfremdung in the context of his critique of capitalism, were are therefore guaranteed. Lada Nakonechna uses this fact consciously by incorporating another mistake when translating from German to Russian and back again and lets Brecht's Verfremdungseffekt change to Entfremdungseffekt. Per definition, alienation means to remove something from or disturb in its accustomed place or set of associations. In consequence, the viewer himself becomes a disturbing factor when following the logical way through the corridor of the exhibition space, manipulating, distorting and covering up the picture on the wall. The picture, in this case, consists of quotes out of Brecht's parable-play The Good Person of Szechwan, a montage of two completely contrary narrative threads – the ulterior world of the Gods and the banal everyday life in the a village of in Szechwan (Appropriated Phrases, 2012). Already in a previous work from 2008, Lada Nakonechna used singular phrases and words and estranged them into empty, cold forms by removing them from their original context, but in the work It's been said before (2008), these were taken from soap operas on Ukrainian TV. Now, the Brecht quotes stand as visual objects in the empty space, they only exist through the light of the projector and are destroyed by every viewer who faces them – and thereby alienated from their original sense. In the third part of the exhibition, the visitor is transformed from being a passive spectator into forming a part of the image himself. While the images were previously composed of scenes of protests and riots taken from the media, overlaid by naturalistic views of nature, the full image is now only partially predetermined by the room-sized wall Incomplete (2012) drawing on the top half and ceiling and completed on the bottom by the person of the viewer and his position within the space. Instead of simply trying to activate the viewer to think about the figures in the work and the prevailing conditions in reference to the V-Effekt, he gets involved in the work by becoming part of it and directly affects its outcome. When artist and viewer change sides and the viewer gets involved in such a way in the work -– a strategy crucial for Lada Nakonechna's works -– then who is the recipient of the message, sent off by the artist only as a first impulse? The works in the exhibition shall not answer questions about how methods and new forms of art are supposed to work, nor do they pretend to be a new form of art. They only show the tryouts, sketches and stages, which the artist undertakes in the search of it. "It is for you to find a way, my friends, to help good people arrive at happy ends. You write the happy ending to the play! There must, there must, there must be a way!" (Epilogue, The Good Person of Szechwan).